Apple’s 27-inch iMac all-in-one desktop has been refreshed to deliver more value for money, better visuals and impressive performance levels. The new, lower-priced iMac packs a stunning Retina 5K display and a powerful quad-core processor for an immersive and enjoyable user experience. Just like its immediate predecessors, the new iMac shows off an elegant and stunningly thin body. It measures only about 5 millimetres at the edge. Perhaps, the main talking point of the iMac is its breathtaking Retina 5K display with an awesome resolution of 5,120 x 2880 pixels. If you thought the regular iMac already has a stunning screen, you will do well to start looking for a better adjective to qualify the new Apple iMac with Retina 5K display. With 14.7 million pixels, this computer’s screen boasts four times as many pixels as the screen of a regular 27-inch iMac. The difference will be immediately clear when you place this latest iMac side by side with the 2014 model. Just like last year’s model, the new iMac with Retina 5K display is driven by powerful 4th-generation Intel Core processors. Depending on the size of your wallet, you can get a unit with a quad-core Intel Core i5 or Core i7 processor delivering speeds of up to 4 GHz. The size of RAM provided on the entry-level model of the 2015 iMac is 8 GB, but you can also have a model with as high as 32GB of RAM if you can shell out the extra cash. An AMD Radeon graphics card crunches graphics on the Apple computer. The 2015 Apple iMac with Retina 5K display is powered by the latest OS X Yosemite desktop operating system, which is specially designed to make the most of the computer’s stunning display. The entry-level model of the latest iMac packs a large 1TB hard drive for storage and it is possible to get a model with up to 1TB solid-state drive. It comes with four USB ports (all USB 3.0), two Thunderbolt 2 ports, a Gigabit Ethernet port and an SD card reader. The Apple computer supports Bluetooth and Wi-Fi 802.11ac. 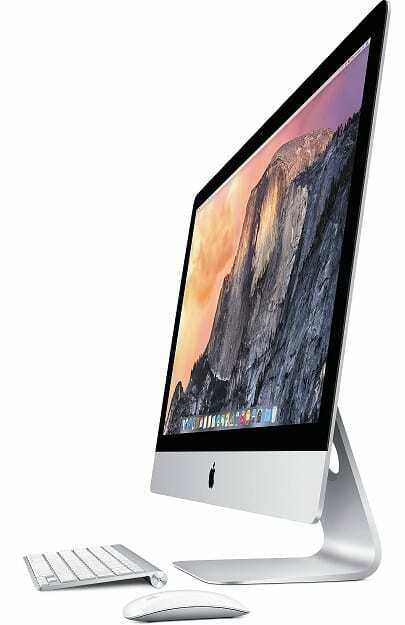 Apple iMac 27-inch with Retina 5K All in One Desktops are not yet available in Nigeria. Apple iMac 27-inch price in Nigeria is expected to start at around N450,000, depending on your location and the configuration of the desktop.